1. MOTO Spot Swing Denim Skirt- £30- I'm not a big skirt wearer but really want to own a few more skirts. 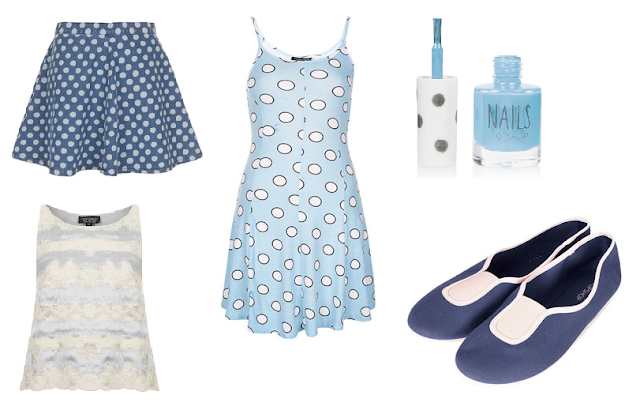 This denim number is perfect for spring and it has polka-dots, which personally sells it straight away for me! 2. Egg Spot Strappy Flippy Dress- £18- This is a real bargain in my eyes and the print is to die for. I think the shape is quite flattering too and I can imagine it suiting most body shapes. 3. Nails in 'Air Kisses'- £5- Is there a better shade of nail polish for Spring out there? It is bright and looks like a clear spring sky, gorgeous! 4. Lace Insert Swing Top- £28- I love the shade of blue in this top and the lace is the perfect finish. 5. True Elastic Gusset Pumps- £16- This is a purchase I can definitely see on the horizon. The design is so simple and classic and in this shade of blue they would really go with anything. Perfect light shoes for spring that look super comfortable. So there you have it! I am so excited for Spring, I hope we get to see a little bit of sunshine as at the minute the weather is just so cold and miserable. What are you looking forward to this Spring? What do you think to these picks? I love the look of Air Kisses! :) Such a pretty colour! gorgeous picks! You make me lovee bluee! I'm loving blues this season too =) That dress is so pretty and looks a lovely shape! Those warm coats is very nice in its design, you can see the leather and fur inside of sheepskin jackets, as well as its pockets, I can put some little things, like my Iphone, keys, very convenient, so try it in www.cwmalls.com. What makes me a little unhappy is the sleeves, they are long for me.